Why are my new controlled vocabulary terms not included in the controlled vocabulary list? It is much easier to add new controlled vocabulary terms in the Project Client then approve these new terms in the CONTENTdm Admin website Approve items page. 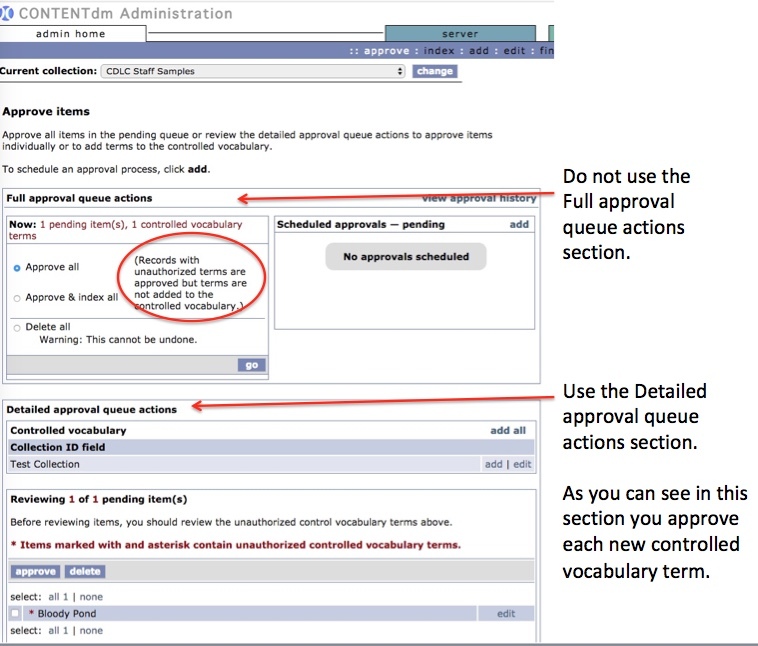 It is a two step process to add new controlled vocabulary terms to an item in the CONTENTdm Admin website - please contact CDLC staff about this. May I add terms to some of the controlled vocabulary lists? If you add a term to Physical Format, Type, Language, Format of Digital, or Library Council please let CDLC staff know. Usually adding new terms to a controlled Vocabulary List is done through the Project Client. The new terms are added to a metadata field such as Subject.Personal_Name. Items are uploaded to the New York Heritage server. In the CONTENTdm Admin website under the Items tab/ Approve/ Approve items window, the Detailed approval queue actions section is used to approve each new controlled vocabulary term BEFORE approving the new items being added to New York Heritage. A new controlled vocabulary term can also be added to a controlled vocabulary list in the Admin web site. If you need this new term because you are adding the new controlled vocabulary term to an item on the New York Heritage server then this is a two-step process. You must add the new controlled vocabulary term to the controlled vocabulary list FIRST. Then you can add the new vocabulary term to the metadata field for an item on the server (Remember you can also bring an item back to the Project Client and add a new controlled vocabulary to the item there. Then the process is the same as above - Adding through the Project Client). Now under the item tab/edit the new controlled vocabulary term can be added to the metadata field for an item on the New York Heritage server. Note - In the Administer controlled vocabulary for: page you can look at the complete controlled vocabulary list by clicking on Browse at the bottom of the page. You can also check to see if you have any terms in that metadata field that do not fit your controlled vocabulary by clicking on Verify, also at the bottom of the Administer controlled vocabulary for: page. How do I check all the terms in a controlled vocabulary list? In Administer controlled vocabulary for: page, click on Browse at the bottom of the page. This gives you the list of all the controlled vocabulary for that metadata field. At this point it is best to look this list over to see if you have any misspelled words, multiple names for the same person or business, etc. These lists can be edited. Note: You can also check to see if you have any terms in that metadata field that do not fit your controlled vocabulary by clicking on Verify, also at the bottom of the Administer controlled vocabulary for: page. I am confused about who the Creator is and who is the Contributor. In the New York Heritage Dictionary, the Creator is the person/company responsible for the making the content of the original item. The Contributor is the person/company responsible for making contributions to the content of the original item. However, this can sometimes be difficult to determine. The Creator is the person being interviewed. The Contributor is the person doing the interviewing. The Creator is the author of the text/story. The Contributor is the illustrator or the editor or the translator. If there is only a Creator then there are no issues but if there is a Creator and a Contributor, things become more difficult and the metadata in these two fields depend on the story you are telling. If the photograph or art piece was created by a famous person and then another (maybe famous) person used this work to create a new original item the question is “who is the creator and who is the contributor?” If you are telling a story about the first person then you may put them in the Creator field and the second person in the Contributor field. If you are telling a story about the second person then this might be reversed. The key here is consistency in your story. 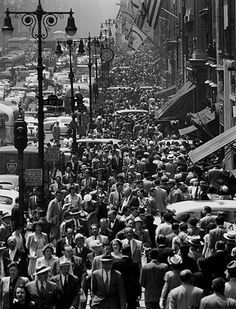 An example of an art piece with this background is Vik Muniz's Noon Rush Hour on Fifth Avenue, 1949, After Andreas Feininger (Pictures of Paper), 2009. Vik Muniz took a photograph by Andreas Feininger and created a new art piece out of paper. Here is the image close up: http://www.book-a-flat.com/magazine/en/vik-muniz-art-paris#jp-carousel-6227 (image takes a while to load). When you are far away the image looks like this: https://s-media-cache-ak0.pinimg.com/236x/6d/fe/92/6dfe923ff6cdc45115b853d6fa34622e.jpg almost like the photograph by Andreas Feininger. Vik Muniz used three shades of paper to create the black and white photo that Andreas Feininger had shot. The question is who is the creator and who is the contributor. The title of the art piece tells the story. We do not know which versions of the songs are used by the conductor. Creators unknown. We do not know if the record was ever published for purchase. Custom pressed by Recorded Publications Company, Camden, NJ 08105. Are there ways to determine the age of a postcard? The date of the original cannot always be determined from the date the postcard was posted. However sometimes much can be determined from posting date and other factors. For example, we have a postcard posted in 1911, the back of the postcard is divided in half, and the postcard was printed in Germany. We may be able to determine the date range from the image and copyright from the posted date. A divided back postcard has a line down the middle, or some other indication that one half of the back is for the address and the other half is for a message. Early postcards had an undivided back. The back of the postcard was for the address only. There was often a statement that said "this side for address only." The postal service started allowing the use of divided back postcards in March of 1907. If your postcard has an undivided back, it is from 1907 or earlier. Does the postcard back indicate that it was printed in Germany? This postcard was printed in Germany and the date range for the end of this kind of printing is after our postcard was mailed. Given the postcard was mailed in 1911 and it has a divided back then the postcard was produced between 1907 and 1911. This does not tell us when the image was taken just when the postcard was produced and you are dating the postcard so I would go with 1907-1911 for Date of Original. How can I type symbols that are not on the keyboard? Sometimes you come across a symbol or special character in a transcript or in a name that you can not find on your keyboard. A good example of this is the UK pound sign - £ - that you might find in a transcript. This special character is not on a US keyboard. Please remember that these keystrokes maybe different for a Mac keyboard. I am confused about the length of a file name and lead zeros. Here is a bit more information on file name lengths. The number of characters in a file name and the length of the pathway to that file are very important when files are migrated. Among the New York Heritage training documents that everyone received for training, the document on file name conventions included the 8.3 conventions for file naming. When these conventions were first created it was thought that file names should be no longer than 8 characters. Today, it is recommended that file names should be less than 30 characters. However, remember that longer is not better for file names. The length of the pathway to a specific file is also important. The pathway to your file includes the names of all folders that must be opened to find that specific file. For the current Mac-OSX system, the pathway length is 250 characters but it is best to keep under 90. In a Windows operating system, the total length for the pathway is 260 characters. Some Window servers, however, will still create a short file name called an 8.3 alias. Another way to think of this is how deep in your computer’s filing system is a file buried. The third set of file names are in the correct format. So again - try to create short unique file names that include your OCLC code and lead zeros if needed. What fields do I put unknown in? Hidden Date - should match information in Date of Original if date or date range is known.. If the Date of Original is unknown but you know the range of years that the building(s) in the image was standing, or if the cars and clothes of the people in the image give you a date range, or if you know the birth and death dates for the people in the image, then this date range can be put in Hidden Date with an explanation for this decision in Description or Notes metadata field. Example: We do not know the actual date of this image but the building in this image was built in 1920 and burned down in 1954. The Hidden Date field would be 1920-1954. This is important because Hidden Date is a hidden field for the public but this field is used for DPLA's timeline. If there is no date or date range in Hidden Date the item will not show up in a DPLA timeline search. Remember the public can search for a date or range of dates and find this item but they will also read in your Description or Note field why the item came up in their search even though Date of Original has unknown in it. They can then decide if they want to use the material or not. Please note: In the past we have instructed people to use 9999 in the Hidden Date field if the date is unknown. We are no longer recommending this. Because of changes to the web site, 9999 will show up as a date on the faceted search if it is input in the Hidden Date field. What is the difference between what goes in the Title, Description, and the Note fields? You want the Title of an item to be brief, descriptive, and unique. The Title may be transcribed from the item itself. The Description, which is a free text field, should describe the item itself so a user will be able to “see” the item. The Description field may also contain keywords and/or local terms for the item that are not in any of the other metadata fields. These are keywords that users might use to search for the item. Background or contextual information may go in the Notes metadata field. In some cases, if you have multiple items depicting, for example, the same school, we recommend that the term for the school always be the same in the Subject.Corporate_Name field because that is a controlled vocabulary. Should I be seeing non-LCSH subject headings in Subject.LCSH? You should only be adding LCSH authorized headings or local cataloging to the Subject_LCSH metadata field. The LCSH controlled vocabulary list in the Project Client is not the complete list of LCSH headings. Authorized LCSH terms that are not in the controlled vocabulary list in the Project Client can be found here: http://id.loc.gov/authorities/names.html. If you have added non-LCSH subject headings you can replace them in the Project Client or in the CONTENTdm Admin website using Item/Edit/Find and Replace. One issue, once these non-LCSH headings are added into your controlled vocabulary they need to be deleted from the controlled vocabulary. The Find and Replace operation will not do this. Ask CDLC staff for the help sheet for editing the controlled vocabulary list OR you can contact CDLC staff and let them know what terms need to be deleted. Are there different ways to add compound objects to CONTENTdm? There are three ways to add compound objects to New York Heritage using the Project Client: the Compound Object Wizard, the Directory Structure, and the Object List. Most of our users use the Compound Object Wizard where one compound object is added at a time to the Project Client. The metadata can be added directly into the Project Client or with a tab-delimited file. The Directory Structure allows one to add multiple compound objects to the Project Client, however, each compound object must be the same type (documents, monographs, postcards, or picture cubes). Also, each compound object must be stored in its own directory and have its own tab-delimited text file. Some scanning vendors provide your data with this structure. I would suggest using this method if a vendor has supplied the digital files to you in this format. How detailed should the LCSH or TGM subject headings be? The question addressed here is when selecting authorized subject headings should one drill down to the level of, for example, a state or even town? It is probably best to keep the subject headings general OR put both a general one and a much more detailed one. How do we treat married women’s names and the names of women with religious names and do we put these in Subject.Persona’_name? All official names for a person should go into Subject.Personal_Name metadata field. Thus a researcher/end user may find all the items related to that person. Specifically for the names of women with religious names, the best practice seems to be to use their baptismal name with the religious name in parentheses- e.g. Jones, Mary Catherine (Sister Mary Catherine). Can I delete/edit controlled vocabulary lists? If you add a term to Physical Format, Type, Language, Format of Digital, and Library Council please let CDLC staff know. Why would you want to edit/delete terms in a controlled vocabulary list? Finally misspelled terms. If so you will want to clean these lists up and/or called CDLC staff for help. At the bottom of the Administer controlled vocabulary for: page, you can look at the complete controlled vocabulary list by clicking on Browse at the bottom of the page. Check the controlled vocabulary terms. Copy the term you want to edit/delete. In Administer controlled vocabulary for: page there is an Add term box and a Delete term box. Paste the term you want to edit or delete from the controlled vocabulary list in the Delete term box. The old term is now deleted from the controlled vocabulary list for the field you selected. If you need to add the term back in its correct format then type the corrected/edited term in the Add term box. Please remember - you have edited/deleted a term in your controlled vocabulary list for that metadata field, however, the old controlled vocabulary term may still be in your metadata for this metadata field. Click on Verify, at the bottom of the Administer controlled vocabulary for: page to check to see if you have any terms in that metadata field that do not fit your NEW controlled vocabulary list. If the edited/deleted term is still in the metadata for that metadata field then the metadata needs to be edited. Call CDLC for a help sheet on this topic. I see a funny symbol in the metadata where an Ampersand was; what happened? This can be an issue in CONTENTdm if you have used an ampersand in a controlled vocabulary metadata field and CONTENTdm has changed the ampersand into the HTML code. If you are editing in CONTENTdm and you see this you will have to change the HTML code back to just the ampersand symbol. This is a known bug in CONTENTdm. Can CDLC help with OCR’ing? If you have text-heavy items (not hand-written one) CDLC can OCR (optical character recognition) the digital file. The digital file should be a JPEG. We will create a PDF with the text embedded in the PDF. You will then import and upload the new PDF file. Please contact CDLC if you are interested in having any of your items OCR'd. Why are there periods in some of the Subject.LCSH headings in New York Heritage? If you are checking out what others have used in the Subject.LCSH metadata field you will notice that some of the terms and phrases have a period in them and others do not. The first term of any LCSH is capitalized and in the older LOC Authorities Files, a period was also used. However, in the new Linked Data Library of Congress Subject Heading website (http://id.loc.gov/authorities/subjects.html) a period is no longer used. We will not be correcting the older metadata information. Why have an Identifier and the file name especially if they are the same? We want you to create an Identifier for each item in New York Heritage. For a single item you can use the file name, without the file extension, as the Identifier and the two fields, File Name and Identifier will look the same. However, for a compound object, if you are using this method to create your Identifier, only one file name (usually the first digital file) will be used for the Identifier. This is because all the digital files in a compound object must have the same Identifier and the digital file names will be unique. It is the one unique piece of metadata for all of the digital files in a compound object. When editing in the CM Admin website, the only way you can pull up all of the page metadata records for a compound object is by the metadata in the Identifier field. Each page metadata record will have a different file name in the File Name metadata field. What field do I put the YouTube URL in so that is shows as a link at the top of the New York Heritage page? CONTENTdm allows you to upload a variety of digital files and it also allows you to upload a URL. For example, if you have uploaded a video to YouTube and want to link to the video from your New York Heritage collection you will import the reference URL that YouTube assigns to your video. Import the reference URL by clicking on Add URL in the menu in the Project Client. Once you have imported the URL you can add the metadata. Once the URL and its metadata have been uploaded to the CONTENTdm admin site and approved and index, end users can click on the URL and view your video on YouTube. It is also a very good idea to add the CONTENTdm reference URL for this item to the information in YouTube so the end user can discover the video and the metadata from either YouTube or New York Heritage. Can I use custom thumbnails instead of CONTENTdm default ones for URL, video, and audio items? CONTENTdm uses a generic thumbnail for any URL, video, or audio file that you import into CONTENTdm but you can create your own thumbnail if you want to. Create the thumbnail that you want to use then put it into the Project Client under Thumbnail settings. In Thumbnail Manager window you can add, delete, and edit thumbnails and the media types and file extensions associated with the thumbnail. Call CDLC staff for help and advice with creating custom thumbnails for CONTENTdm and New York Heritage. I am confused about using a PDF in CONTENTdm and how the PDF will display in New York Heritage? CONTENTdm also allows you to upload multiple single page PDFs as a compound object. The main use of this is when you have scanned multiple jpegs for a single item and CDLC has OCR’d the jpegs and saved each OCR'd jpeg as a single page PDF with embedded text. Also if a vendor has created multiple single page PDFs for a single item. The only drawback to working with a single PDF file that consists of multiple pages is if you have to change an image on any one or more of the pages. You must replace the complete compound object (which is really just one PDF file). Note – remember you can upload multiple single PDFs as a compound object too and in this case, you will only have to replace the single PDF file that has any issues. Finally, CONTENTdm is designed to work with the Adobe Acrobat Reader for PDFs. However, many of the Internet browsers now have their own build in PDF viewer and there have been issues viewing PDFs in New York Heritage depending on what operating system your computer has and what Internet browser and version you are using to display the PDFs. How do you add another item to a collection once it has already been uploaded to New York Heritage? Two metadata fields - Collection ID and Digital Collection - control which collection an item is part of in your digital collections in New York Heritage. New York Heritage/ESLN staff have set up queries dependent on these two metadata fields in New York Heritage to separate the different collections. When you add a new item to your digital collections these two metadata fields determine what collection the new item will be added to. If you have added an item to New York Heritage and then decide the item should be in another collection you need to edit these two metadata fields - Collection ID and Digital Collection - so they match the metadata for the collection you want the item to be in.